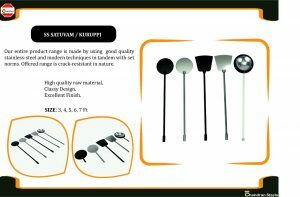 We are amongst the leading name in the industry, delivering an exceptional range of Stainless Steel Soup Ladle that is strong in nature and used for serving Soup. Our entire product range is made by using good quality stainless-steel and modern techniques in tandem with set norms. Offered range is crack-resistant in nature. For over many yearsCHANDRAN STEELSis the one of the leading household brand gratify the needs of the clients across the country. Our company established in the year 1980 as a Sole Proprietorship based firm with its office based at COIMBATORE , Tamil Nadu, (India). Our company is the one stop destination for the utensils. We built alliances and became the most favored choice of homemakers on the basis of quality, reliability and finishing of the products. Our all products are quality tested and designed by the proficient personnel’s as per the specifications of our esteemed clientele. We are the manufacturer, supplier, trader and wholesaler ofStainless Steel Ladle, Idly Pot, Kitchen Utensil, Stainless Steel Turner and many more.CHANDRAN STEELS commits on its core values of customer trust, beliefs in business practices and quality in products. The sole aim of our firm is to provide the excellent quality stainless steel kitchenware. At CHANDRAN STEELS , products are manufactured with the finest quality stainless steel by following all quality norms of the industry. The dedication in both the cases in terms of value addition to the products and its efficacy is always done with highest concentration. CHANDRAN STEELS , a unique firm in a fast-paced marketplace believes in building long-term, trusted relationships and brings a high level of energy, integrity, experience and value to our client’s unique needs. Amongst the various reasons behind CHANDRAN STEELS unprecedented growth and rapid integration on the steel value chain, perhaps, the most important would be its unwavering focus on acquiring the latest technology and know-how. The most important reason behind this focus has been CHANDRAN STEELS commitment to provide its customers with the best quality products which has helped the company build a massive empire out of colossal business.